The San Bernardino County Library invites residents to ‘Help Us Soar’ as librarians strive to meet the goal of checking out six million items during this fiscal year. Sign up for a library card during Library Card Sign Up Month. In September, new library card owners will get a limited edition Disney Incredibles sticker while supplies last. Sign up for a traditional library card online or in person at a local County library, or sign up for an eContent card online. Obtain a traditional library card. A library card issued in person from a branch gives the owner access to physical materials, such as books, DVDs, CDs, and magazines at all 32 branch libraries, as well as access to branch public computers and printers. Traditional library card holders will also have access to all electronic resources available to eContent card holders. Get an eContent card on the County Library website www.sbclib.org. The eContent card acquired from the County Library website gives the owner access to electronic materials such as eBooks, audiobooks, music, and digital magazines. This is a great option for residents of California who are unable to visit a physical library location. Download digital resources such as OverDrive and Cloud Library for eBooks and audiobooks, Freegal music, and digital magazines. The ‘Help Us Soar’ campaign is another opportunity to celebrate and support the Countywide Vision’s literacy campaign, Vision2Read. Reading at grade level by the third grade is one of the greatest predictors of children’s success in school, their likelihood of going to college, and their future earning potential. 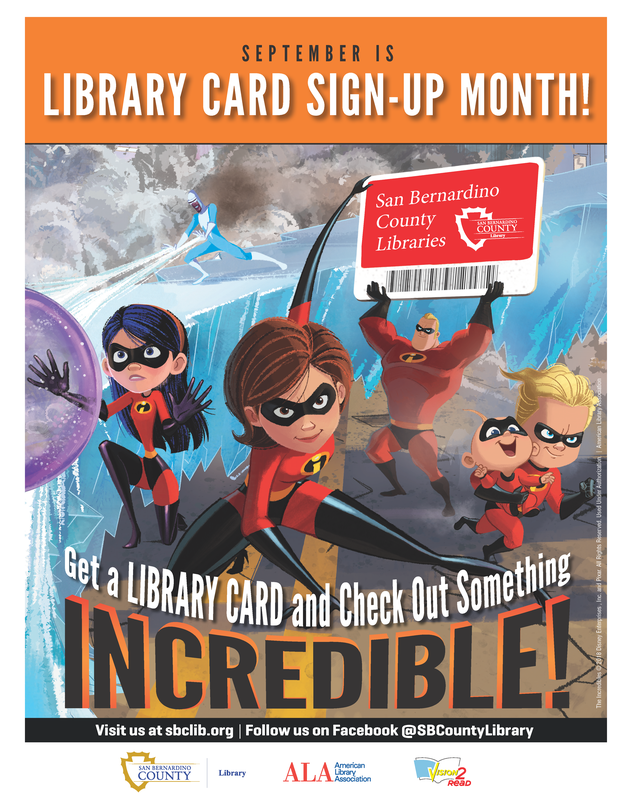 The San Bernardino County Library system facilitates programs and events at all branch libraries to encourage children to check out books to read. 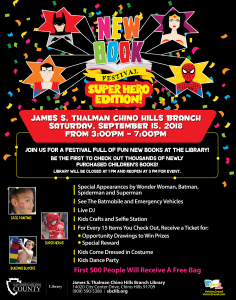 The San Bernardino County Library invites residents to the Chino Hills James S. Thalman Library for the Annual New Book Festival. Once again, thousands of new books will be available to customers for the very first time. Be among the first to crack open one of these wonderful new titles. Come and celebrate literacy and meet Wonder Woman, Batman, Superman, and Spider Man. Don’t forget to take pictures. Visit for a chance to see the Batmobile, a fire engine, or a police car up close. Build memories in our Jumbo Block play area, make fun crafts, enjoy face painting and balloon artists, dance to a live DJ, and much more. This event is another opportunity to celebrate and support the Countywide Vision’s literacy campaign, Vision2Read. The Annual Chino Hills New Book Festival will take place on Saturday, Sept. 15 from 3 to 7 p.m. Visitors should bring their library card, as every 15 items checked out during the event earns visitors an opportunity drawing ticket for a chance to win awesome prizes. All activities are free and open to all ages. 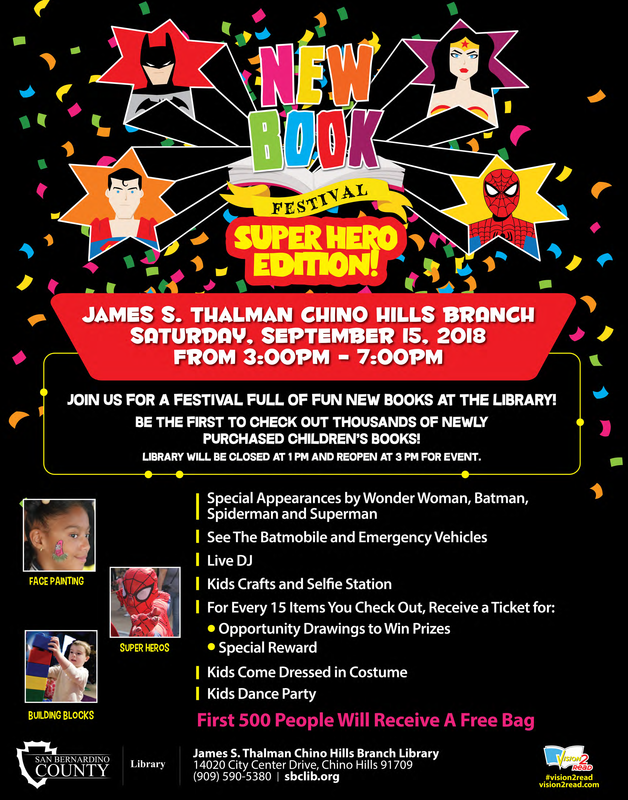 The Chino Hills Library is at 14020 City Center Drive in Chino Hills. 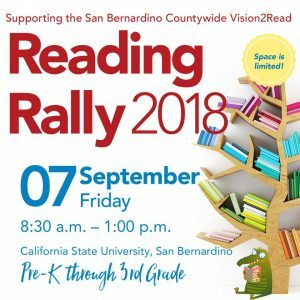 The San Bernardino County Superintendent of Schools will hold a reading rally on Sept. 7 for pre-kindergartners to third-graders on the campus of California State University, San Bernardino. The reading rally will take place from 8:30 a.m. to 1 p.m. The event is in support of San Bernardino County’s Vision2Read Initiative, which looks to promote early literacy and support all children from cradle to career. Cal State San Bernardino is located at 5500 University Parkway in San Bernardino. For more information about the reading rally, call the County Schools’ Communications office at 909.386.2413. 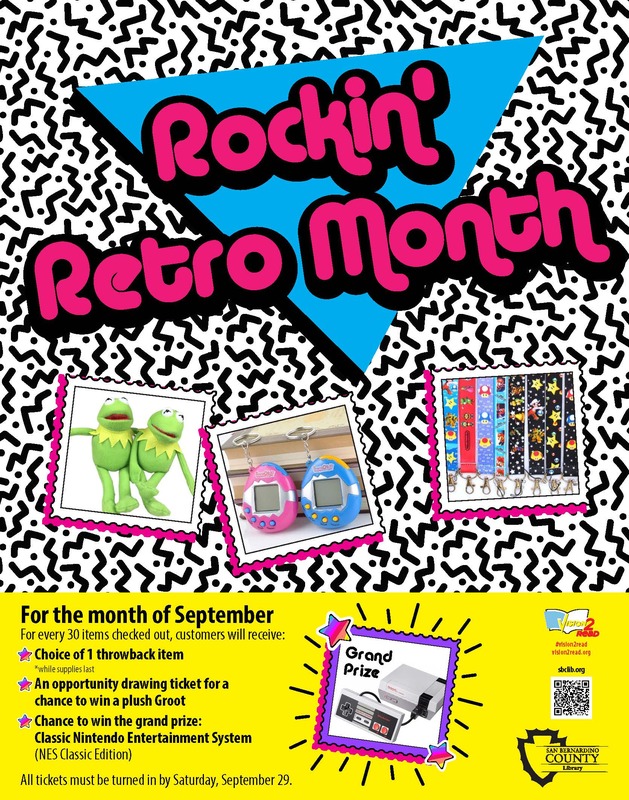 The San Bernardino County Library invites residents to boogie on over to the library during the month of September for the first ever Retro Month celebration. 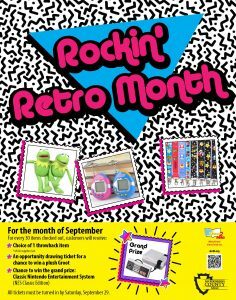 Retro Month will be celebrated throughout the month of September and occur in all San Bernardino County Library branches. Every 30 items checked out earns a choice of a plush Kermit The Frog keychain, Tamagotchi, or Mario themed lanyard (while supplies last), as well as an opportunity drawing ticket for a chance to win the grand prize: a Classic Nintendo Gaming system. Throughout the month, there are also special events and storytimes at various library locations. These events are another opportunity to celebrate and support the Countywide Vision’s literacy campaign, Vision2Read. Sep. 5 from 4 to 7 p.m., Hesperia Branch Library, 9650 7th Avenue in Hesperia. 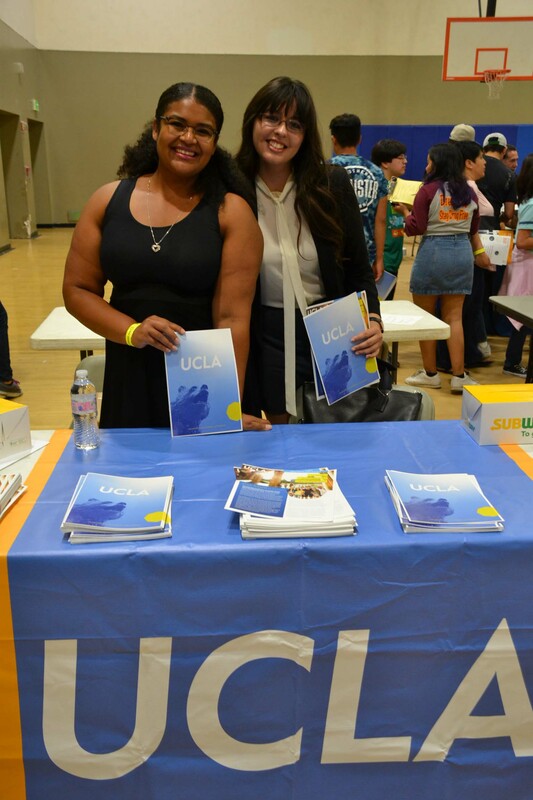 Sep. 11 from 4 to 7 p.m., Lewis Library & Technology Center, 8437 Sierra Avenue in Fontana. Sep. 18 from 4 to 6 p.m., Newton T. Bass Library, 14901 Dale Evans Parkway in Apple Valley. Sep. 25 from 3:30 to 5 p.m., Running Springs Branch Library, 2677 Whispering Pines in Running Springs. Sep. 29 from 12 to 2 p.m., Chino Branch Library, 13180 Central Avenue in Chino. Sep. 6 from 12 to 1 p.m., Rialto Branch Library, 251 West 1st Street in Rialto. Sep. 13 from 10:30 to 11:30 a.m., Sam J. Racadio Library & Environmental Learning Center, 7863 Central Avenue in Highland. 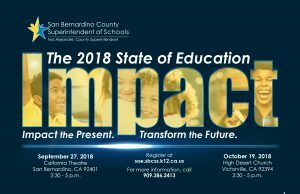 San Bernardino County Superintendent Ted Alejandre will deliver the annual State of Education address on Sept. 27 in San Bernardino and Oct. 19 in Victorville. Both events begin at 3:30 p.m. with a reception following. Alejandre will provide updates on the positive developments taking place in our public schools and collective impact efforts as part of the Countywide Vision. He will also be showcasing outstanding students and programs for San Bernardino County Schools and the 33 school districts in our county. To register, visit soe.sbcss.k12.ca.us. For more information, call (909) 386-2413. The San Bernardino County Community Vital Signs Initiative is excited to announce the launch of its newly redesigned website. Community Vital Signs works in partnership with sectors across the county to support the wellness element of the Countywide Vision. The redesign, which further reflects the vibrancy of San Bernardino County and its residents, is now easier to navigate, with improved functionality across all platforms and browsers. Visitors will experience a better user interface with intuitive streamlined menu operations that will direct visitors to community efforts, data, and information to keep them informed of the progress and the efforts of the initiative. There are several entry points allowing residents to participate in helping make San Bernardino County a better place to live, work, and play. Users can begin by visiting the website at www.CommunityVitalSigns.org and take advantage of the site’s new features and benefits. Adequate water will be available to sustainably meet the needs of San Bernardino County residents and businesses through 2040 only if water users continue to improve water-use efficiency efforts and the public; state; regional and local government leaders; and developers are willing to collaborate and invest in projects that will store, reuse, protect and convey water supplies. That was the conclusion of a 2018 update of a complete inventory of the county’s water resources presented today at the Annual San Bernardino County Water Conference in Ontario. 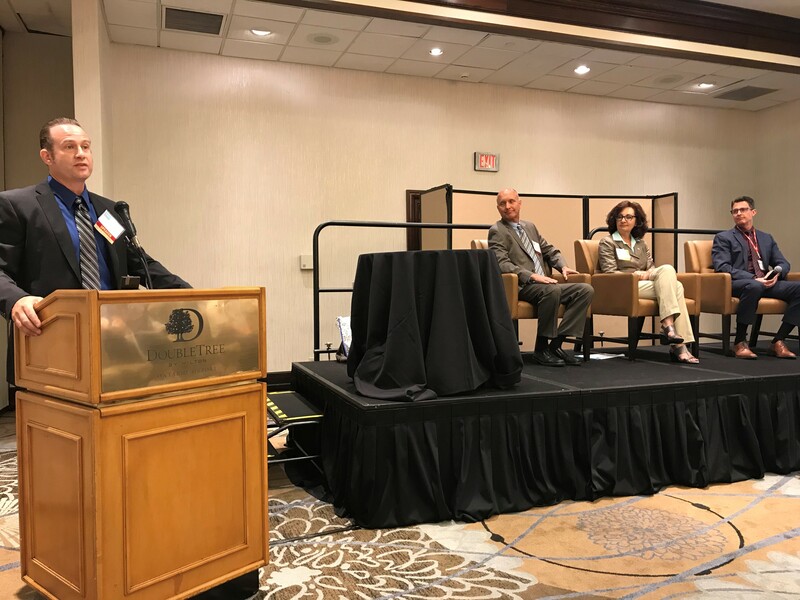 The inventory is a product of the Countywide Vision Water Element Group’s efforts to bring together the leaders of all county water agencies and other experts to work cooperatively on solutions to a potential imbalance between population growth and water supply. The inventory shows that the combined current and projected supplies of San Bernardino County water agencies will meet the demand of the county’s growing population in normal years and drought years through 2040. A projected increase of water supplies of 44,000 acre feet per year (afy) to a total of 819,000 afy by 2040 assumes substantial investment in enhancements to the State Water Project, stormwater capture and recycled water. Per-capita water demand (total water use divided by population) is projected to decrease about 8% from 2020 to 2040 as more residents and businesses make conservation a way of life. As a result, while the population is projected to grow from 2.18 million in 2020 to 2.78 million by 2040, the combined Urban and Agricultural water demand within the county is expected to increase at a much slower pace – from a total of about 600,000 afy in 2020 to about 700,000 afy in 2040. The Countywide Vision Water Element Group is made up of leaders from county water agencies, business representatives and other stakeholders. It was formed in January 2012 to develop a long-range plan to ensure water sustainability for San Bernardino County’s future. The Vision Water Element group will continue to use the information contained in the inventory to promote partnerships among water agencies and other stakeholders within the county, improve water management and efficiency, protect and conserve water resources, and identify the most important next steps the group should take to embrace the environment in which we live. The Countywide Vision was developed in 2010-11 in an effort to identify a common goal for all county communities and residents. The Vision was created from information received during 18 community meetings, an online survey, more than two dozen expert roundtables, and data from the county and all 24 cities and towns. 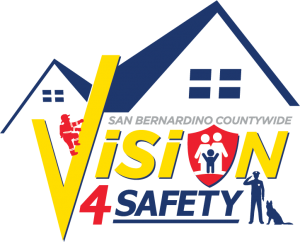 The Board of Supervisors today adopted Vision4Safety, a new campaign that aims to improve safety and emergency preparedness in San Bernardino County by connecting people to community policing, emergency response and disaster planning programs and encouraging them to follow professional tips to keep their families safe. The Vision4Safety campaign officially kicks off Tuesday, Aug. 7 on National Night Out, a community-building event that promotes partnerships between communities and police and emergency services. A listing of National Night Out events in San Bernardino County can be found at www.Vision4Safety.com. Participants in the Vision4Safety campaign are encouraged to post a photo or video or livestream on social media using #Vision4Safety. Posts will be shared on Facebook at San Bernardino Countywide Vision or on Twitter and Instagram @SBCVision. The community-driven Countywide Vision project is focused on creating a safe, healthy and prosperous future for all who live, work, play and otherwise invest in the county. Public safety has a direct and profound impact on several elements of the “complete community” the public desires, especially jobs and the economy, education and wellness. Several studies have shown a correlation between a reduction in violent crimes and an increase in housing values. Such studies also find that exposure to violence and crime at school, home or in a neighborhood can impact a child’s emotional and cognitive development and cause depression, violent behavior and poor performance in school. According to a 2006 survey of more than 600 California youth ages 12 to 17 commissioned by “Fight Crime: Invest in Kids,” teens left unsupervised three or more days per week are twice as likely to spend time with gang members after school and three times more likely to engage in criminal behavior than teens who are supervised. Crime is not the only factor impacting the safety of the county. Earthquakes, wildfires and floods also occur in the county with the potential to disrupt communities and cause damage and casualties. While the public safety agencies are responding to an emergency, citizens are expected to provide for their own needs for at least 72 hours following a catastrophic event. It is important that every household and business have an emergency preparedness plan and supplies, and regularly practice the plan. A 2015 survey conducted by the Federal Emergency Management Agency (FEMA) found that only about 40 percent of American adults say they have developed an emergency preparedness plan for their home, discussed it with their household, or practiced a plan at home or work in the past year. 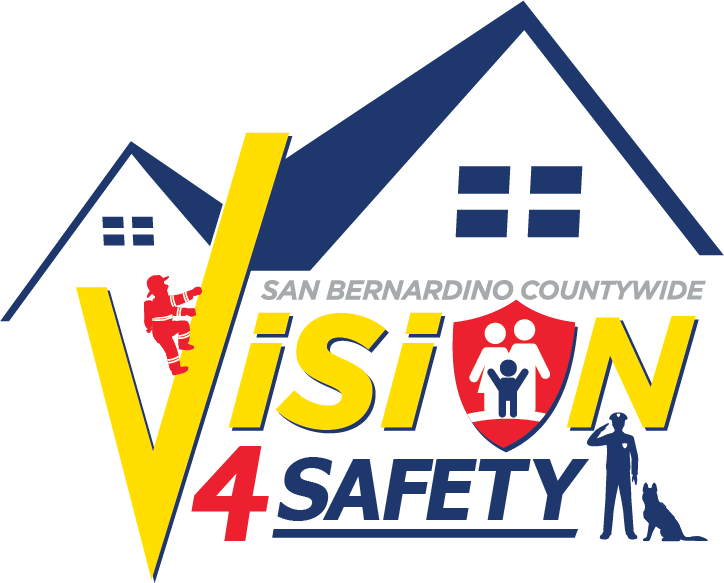 Throughout the campaign, www.Vision4Safety.com will serve as a resource and provide residents with information about connecting with all the law enforcement and fire agencies in San Bernardino County, how to get involved in neighborhood watch groups, volunteering for emergency response and disaster planning programs, and signing up for local after-school programs. The site will also serve as a one-stop shop for videos on emergency preparedness planning and safety tips for families and businesses. Links to download the Ready SB app are also available at www.Vision4Safety.com. The Countywide Vision was adopted in June 2011 by the Board of Supervisors and the San Bernardino Council of Governments in partnership with the community in order to develop a roadmap for the future of San Bernardino County, which includes creating a healthy and prosperous future for all who live, work and play here. Vision4Safety is the third public campaign of the Countywide Vision Project following the successful Vision2BActive physical fitness initiative that began in December 2016 and the Vision2Read literacy initiative that started in September 2015. San Bernardino County Superintendent Ted Alejandre and the San Bernardino County Literacy Partners are encouraging the public to join the Footsteps2Brilliance (F2B) 5-Million Words Summer Reading Challenge 2018. The Summer Reading Challenge runs until Sept. 7 with a goal for children to read 5-million words during the summer months. F2B is part of the San Bernardino County’s Vision2Read Initiative, a collective impact model involving multiple agencies working collaboratively to increase literacy rates among children and families. F2B is an innovative early learning mobile technology platform that provides free access to early literacy activities to all families with children birth through pre-kindergarten who reside in San Bernardino County. Families with children aged 0-5 can download the app at: www.myf2b.com/register/sanbernardinocounty. Reading participation will be recognized at the end of the summer challenge. Additional summer reading programs and resources are available through the San Bernardino County Library and can be found at www.sbclib.org. Enter the San Bernardino County Library Reading Program 2018 to win prizes and earn tickets for a grand prize opportunity drawing. 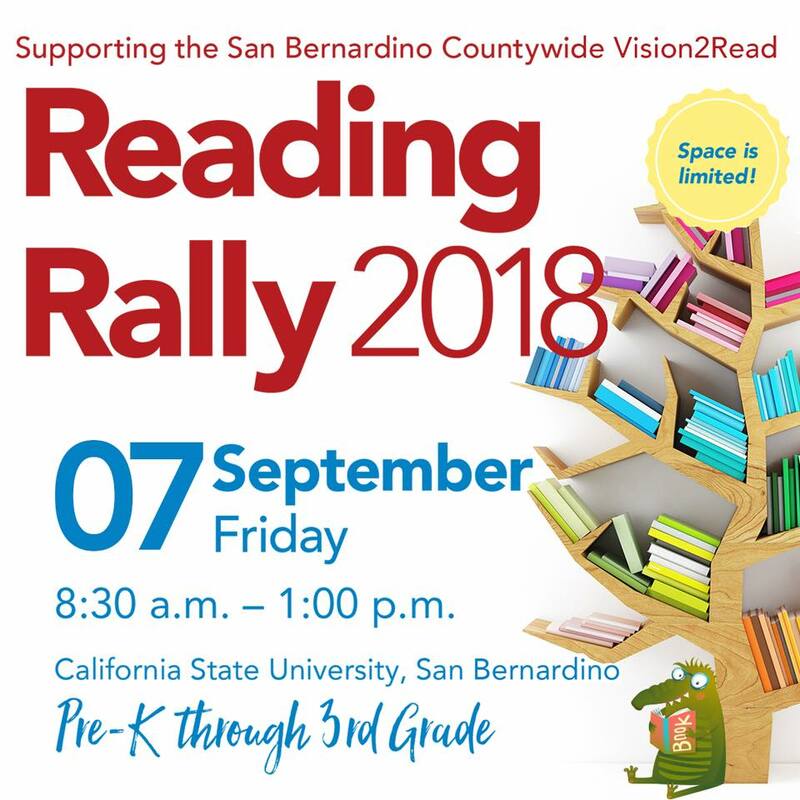 Join County Superintendent Alejandre and the San Bernardino County Literacy partners to raise the bar for literacy and get involved with the 5-Million Words Reading Challenge today. Vision2Read is a collective impact initiative involving government, education, health care, public safety, business and labor, community and faith-based leaders, and parents and families. Vision2Read support the San Bernardino Countywide Vision and its regional educational goal of supporting the success of every child from cradle to career. It is designed to help improve literacy throughout San Bernardino County by connecting people to literacy programs. www.vision2read.com. The San Bernardino County Superintendent of Schools (SBCSS), San Bernardino County Preschool Services, Children’s Fund, and First 5 San Bernardino are partnering to deliver the F2B program for free to all children ages 0-5 who reside in San Bernardino County. Applications are now being accepted from business, non-profit and government organizations wanting to participate in the Third Annual Colton Joint Unified School District College and Career Fair, to be held from 5:30 to 7:30 p.m. on Wednesday, Oct. 3 at the Gonzales Community Center, 670 Colton Ave. in Colton. This popular event is a collaborative effort of the Colton Joint Unified School District and City of Colton with sponsorship from the law firm of Atkinson, Andelson, Loya, Ruud & Romo, Omnitrans, the Inland Empire Economic Partnership, and Horace Mann Insurance (Marcos Mata Agency). Businesses, government organizations, and non-profits are invited to participate by sharing career pathway information with students. This is an informational-only opportunity and no sales of any kind will be allowed. A table and chairs will be provided to all accepted participants at no cost. The fair has become a popular tradition in Colton, with the district’s first two annual events each drawing more than 3,000 in attendance. The College and Career Fair features more than 100 booths representing colleges, universities, technical/trade schools and career pathways. The event also features workshops on how to pay for college and complete the Free Application for Federal Student Aid (FAFSA). Fun, hands-on activities will allow younger students to explore STEAM (Science, Technology, Engineering, Art and Math) fields. For more information, please contact CJUSD Communications Specialist Jacquie Paul at 909-580-6502 or Jacquie_Paul@cjusd.net.